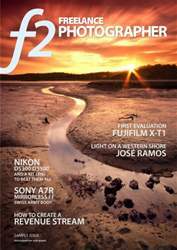 Get your FREE Sample issue of f2 Cameracraft today! (0 Customer Reviews) | Write Review 6 issues per year f2 Cameracraft is the essential magazine for anyone interesting in turning their photographic skills into income, whether as a full-time career or a revenue stream to enhance lifestyle and financial independence. f2 Cameracraft is published six times a year as a premium quality print edition weighing over 330g with a cover price of £4.95 (as of April 2014). Each single issue with 68 pages on luxury book-grade paper costs over £7.50 to post to the USA or Australia. We are pleased to make it available here as an electronic edition to extend our reaership worldwide without the high postage costs required for a publication of this type. A complete makeover marks the return of f2 magazine to its original creators, Icon Publications Ltd, and editor David Kilpatrick. There's more variety of content and the strong technical side returns to f2's pages. More images, more articles, and for the printed edition a boost in quality. f2 will be every two months from the May/June edition. f2 Cameracraft is the essential magazine for anyone interesting in turning their photographic skills into income, whether as a full-time career or a revenue stream to enhance lifestyle and financial independence. f2 was founded in 2004 by David Kilpatrick, who has taken over the magazine again from April 2014 after seven years with a different publisher, and invested in a major upgrade to the quality and content. Issues after April 2014 are significantly different from those before, which you can still obtain as back issues. The new content is more varied and less predictable, with a wide range of topical reports on freelancing, the stock photo business, profiles and portfolios, an open gallery, success stories… even the occasional failure story… expert equipment reviews which are not ‘tests’ but advice on performance and practical use. 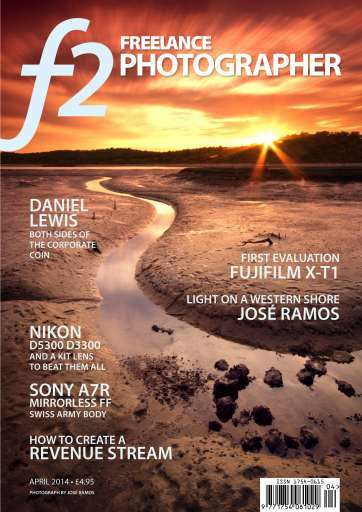 A typical issue of f2 contains 30-35,000 words and over 150 images. It doesn’t just feel like a book, it’s got as much content as a book! You'll receive 6 issues during a 1 year f2 Cameracraft magazine subscription. You'll receive 6 issues during a 1 year f2 Cameracraft magazine print subscription.